I was just browsing some recent pictures before I start a new folder for 2012 (WHAT the WHAT?) and here are a few that I love. We went to Blenheim Palace back in November and while we were there, our friends introduced us to the awesome world of geocaching. 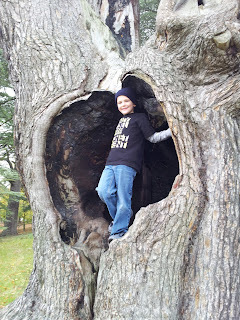 During our hunt, we found this huge tree that has a giant hole in the middle....the perfect size for kids to play and pose. 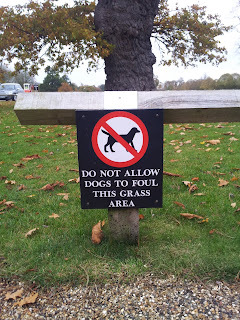 I thought this sign was hilarious. 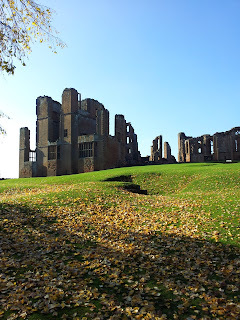 Apparently, I'm a weirdo because as I was cracking up, everyone else was like, "Yeah, sure...um, it's kinda funny..."
The next couple are from Kenilworth Castle. 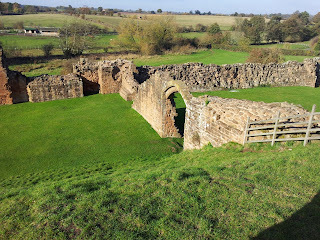 It's a beautiful ruin that we were able to visit a couple of months ago. Our kids had no idea that there is anything special about them playing tag with their friends in the shadow of a 900 year old castle. You know, just everyday fun. Here is the most recent picture taken of me. Ha ha! Just kidding but isn't he cute? We went to a drive through safari park and the monkey section is one wild ride. This guy hopped on our hood and pretty much used us as his way from one side of the park to the other. We got a kick out of him. Thankfully, we don't have an external antennae on our car because the car in front of us did and they left the monkey park with only half of an antennae. As is any normal two year old, Caroline is obsessed with Elmo. She's all about anything with the little red guy's face on it. Imagine our delight when we heard that USO was doing a Sesame Street Live tour on our base!! We knew how much she would love it so we made sure to get there early. The tour manager heard how much she loves Elmo and came out to get us before the show. He set up a special meeting for our girl with her favorite fuzzy red monster. We waited backstage while he went to retrieve E-L-M-O. We were all so giddy to see her reaction and because we were so excited, she was excited. Even though looking back, it's clear that she had no idea what she was so excited about because the second he rounded the corner and headed her way, she FREAKED HER FREAK OUT. She was holding on to me for dear life and screaming her head off. Poor Elmo backed away and stood in the corner waiting for her to warm up. When she was settled, we knew the only way she'd pose with Elmo would be in a group shot. With her posse around her, she felt less threatened by the monster and she seemed calm, yet still very suspicious. Until he put his arm around me for the picture and his (giant) fuzzy hand touched her. It was over. THE END. This is the best picture we got and I know this makes me a horrible mom but this picture tickles me to no end. C'mon. It's straight up Sesame Street in Crazy Town. Brother's bank robber bandanna, Sister hiding behind something because she's stuck with a sit-com family, J's crazed "take the picture and run" look and me laughing so hard I can't stand it. Two people (one people, one monster) not laughing? Caroline and Elmo. I think both will be needing therapy after this encounter.